One of my favorite stories of the late pastor Chuck Smith is from one of the pastors in the group he discipled as the Jesus Movement and Calvary Chapel first started. This pastor said that in their weekly meetings, they would often ask pastor Chuck if there was any concern weighing on his heart that he was praying for regarding the church and especially the leaders in the church. His response was always the same: he was most concerned that they would one day begin to work in the flesh and not in the Spirit. Out of all of the things that he could be troubled over during this time of massive revival and spiritual transformation in people, his greatest concern was to make sure that everything he did was by the grace and leading of God’s Spirit rather than his own efforts. especially when it comes to producing the fruit of the Spirit within our lives. When you consider the fruit of the Spirit, do you think some are easier than others? Even non-Christians who do not have the Spirit of God can be considered peaceful people. This is because although none of us are perfect, we are still made in God’s image and reflect pieces of Him, regardless of how broken we are. And this brings the temptation to rely on our own “goodness” in areas we are “naturally” bent towards. Maybe you are more bent towards being joyful, or patient with people. Maybe your personality leads itself to being faithful or disciplined. It’s easy to think that we don’t really need God to help us in those areas; we’ve got them covered. However, God’s Word tells us that it’s impossible to truly please God without faith in Him (Hebrews 11:6) and that even our good works, without His grace, are like dirty rags (Isaiah 64:6). I think we all see our shortcomings clearly. Maybe you are someone who grows impatient quickly, or who finds it hard to be gentle. It is easy to see that we need God’s Spirit to fill us to empower us to be those things. But the danger is found in the things we naturally do better. They lead us to thinking we don’t need God’s help. They lead to a prideful heart, which God opposes above all else. 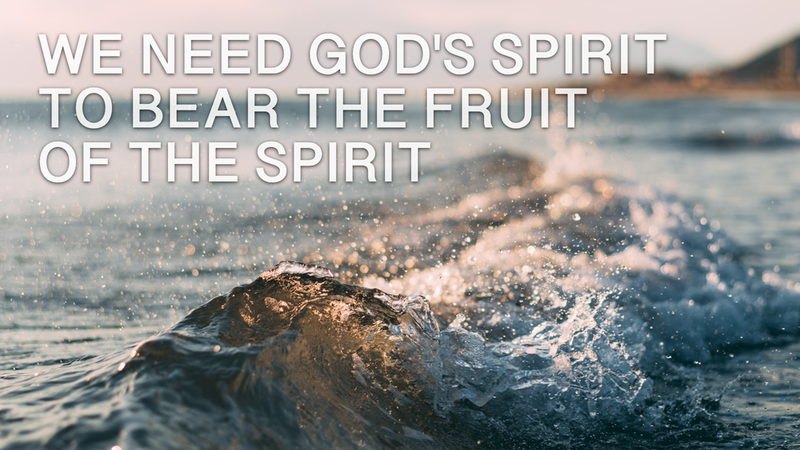 Whether a godly character trait comes “easy” or not, we need to realize our complete need for God’s Spirit to bear the fruit in our lives that only He can do. As Jesus reminded us in John 6:63 "It is the Spirit who gives life; the flesh is no help at all”. So let us let Him do it.